I had this thick knit in my stash for a very long time, maybe more than 3 years. It was one of the fabrics that I brought with me when we moved to Canada, because it was beautiful and I wanted to make something I would wear for a long time. 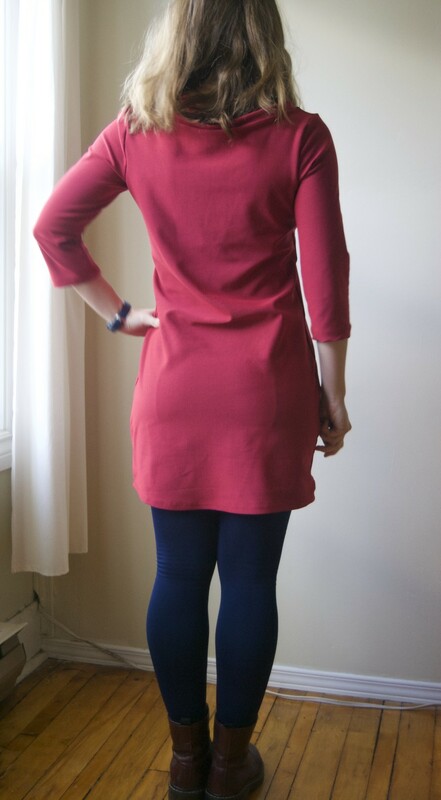 When Seamwork magazine introduced Mesa I finally decided to cut into this fabric. It wasn’t all fun and games though. I spend an entire day stitching and unstitching. Neither my serger and my sewing machine wanted to sew this with the matching thread I had bought for this. My twin needle snapped too. In the end I had to let it marinate for a week and get back to it with a calmer mood and ready to be ok with sewing it with white thread. I bought a new twin needle. This snapped as well. I might have not been completely zen in the end. I finished the whole dress in tiny zig zag stitch. Looking at the photos I notice there’s a lot of extra fabric at the back, any ideas how I can fix this? Would darts work? This fabric is very interesting, yet so difficult to work with. When you look at it, it seems like a really nice sweater knit with a soft inside and a crisp outside of the fabric. But the elastic fibres in the knit are quite strong (it reminds me a big of scuba fabric) so even though it’s elastic it doesn’t drape too much and it’s quite rigid for a knit. It doesn’t feel like plastic at all though and I am hoping that after a few washes and drying cycles the fabric will loosen up a bit. We’ll see. Pattern notes: I removed the slits at the hemlines and make 3/4 sleeves. I cut an M because I didn’t remember if I pre-washed the fabric (oops 🙂 and ended up grading the to an S around the waistline. Next time I want to alter the neckline as I am not completely happy with the boat neckline. It looks great as it is but when you layer, problems happen 🙂 Plus I don’t like my lingerie straps to be showing. Also, I should make a long sleeve version as well. Fabric: 1.3 meters thick, rich, elastic knit that broke two double needles (aargh!) and was a pain to sew! I bought this from a trip a few years ago and I don’t remember how much I paid for it. Let’s say a 10. Notions: Doble needle 15 (never buy your double needles at the fabric store! ), thread from my stash.